MyTeachingPartner™, or MTP, is a system of professional-development supports developed through the Center for Advanced Study of Teaching and Learning. MTP improves teacher-student interactions, which in turn, increases student learning and development. Learn more about one teacher's experience with the myTeachingPartner coaching experience. The suite of MTP professional-development supports contains three specific resources that may be used either individually or in tandem. All three MTP resources rely on a standardized observational assessment of teacher-student interactions—the Classroom Assessment Scoring System, or CLASS—as the primary way to observe and define effective practice. 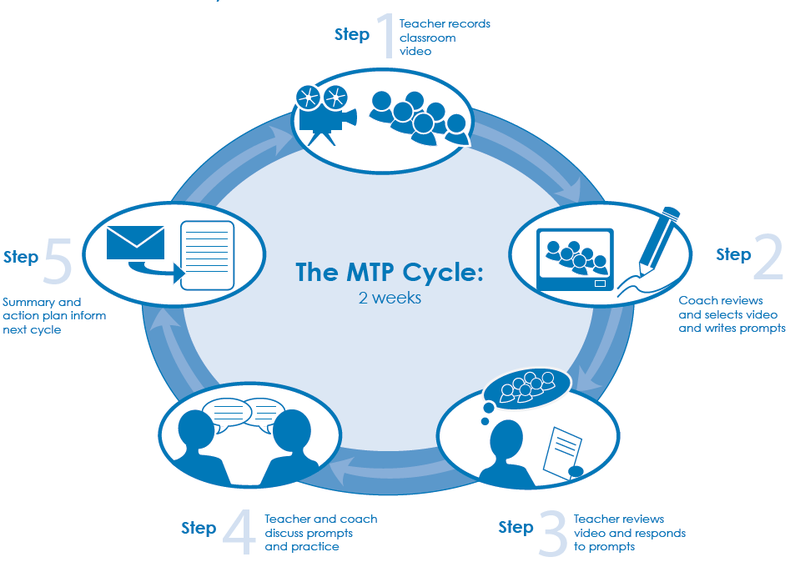 A video library with examples of best practice: The MTP video library—more than 400 one- to two-minute video clips of teachers’ effective interactions with students from pre-K to high school—gives teachers an opportunity to observe other teachers’ effective interactions as they implement a wide range of instructional activities in various contexts. A college course: This three-credit college course focuses on improving teachers’ knowledge of effective interactions, their skills in identifying effective interactions, and applying those skills to their own classrooms. Teachers participating in MTP coaching made significant gains in reading and responding to students’ cues, using a variety of formats to actively engage children in instruction, and intentionally stimulating language development. Teachers who had access only to the video library and made regular use of it were observed to be more sensitive and responsive to children’s needs, more proactive and effective at managing behavior, and more skilled at maximizing children’s learning time. Children in MTP-coached classrooms made greater gains in receptive vocabulary, task orientation, and prosocial assertiveness. Teachers who completed the college course demonstrated increased knowledge of effective interactions, improved skills in identifying these interactions, and greater use of effective interactions in the classroom. On average, student gains were equivalent to increasing the achievement status of every student in a class taught by a teacher who had been in MTP Secondary from the 50th to the 59th percentile, and to preventing one student from otherwise failing the end of year state assessment. These impacts on student learning were due to changes in student-teacher interaction within the classrooms. MTPS was able to close the racial disciplinary gap in classrooms by improving the rigor and effectiveness of classroom instruction. Allen, J. P., Pianta, R. C., Gregory, A., Mikami, A.Y., & Lun J. (2011). An interaction-based approach to enhancing secondary school instruction and student achievement. Science, 333, 1034-1037. Downer, J. T., Kraft-Sayre, M., & Pianta, R. C. (2009). On-going, web-mediated professional development focused on teacher-child interactions: Feasibility of use with early childhood educators. Early Education & Development, 20(2), 321–345. Hamre, B. K., Justice, L. M., Pianta, R.C., Kilday, C., Sweeney, B., Downer, J. T., & Leach, A. (2010). Implementation fidelity of MyTeachingPartner literacy and language activities: Association with preschoolers’ language and literacy growth. Early Childhood Research Quarterly, 25, 329–347. Hamre, B., Pianta, R., Burchinal, M., Field, S., LoCasale-Crouch, J., Downer, J., Howes, C., LaParo, K., & Scott-Little, C. (in press). A course on effective teacher-child interactions: Effects on teacher beliefs, knowledge, and observed practice. American Education Research Journal. Kinzie, M. B., Whitaker, S. D., Neesen, K., Kelley, M., Matera, M. & Pianta, R. C. (2006). Innovative web-based professional development for teachers of at-risk preschool children. Educational Technology & Society, 9(4), 194-204. Mashburn, A. J., Downer, J. T., Hamre, B. K., Justice, L.M., &Pianta, R. C. (2010). Consultation for Teachers and Children's Language and Literacy Development during Pre-Kindergarten. Applied Developmental Science, 14, 179-196. Pianta, R. C., Mashburn, A. J., Downer, J. T., Hamre, B. K., & Justice, L. M. (2008). Effects of web-mediated professional development resources on teacher-child interactions in pre-kindergarten classrooms. Early Childhood Research Quarterly, 23, 431–451. Whitaker, S. D., Kinzie, M. B., Kraft-Sayre, M. E., Mashburn, A., & Pianta, R. C. (2007). Use and Evaluation of Web-based Professional Development Services Across Participant Levels of Support. Early Childhood Education Journal, 34(6), 1573-1707.